If only Saturday’s loss had been to USC, Stanford, or Washington — against one of the Pac-12’s better programs — I’d feel much better about things. I could say that the Ducks are a legit top-25 team, that they scratched and clawed to the bitter end against one the conference’s premier teams, and almost pulled it off. I could say that their mistakes, penalties, soft run defense, lack of execution and allowance of big plays were largely due to playing a top-tier program. But alas, the Ducks played Arizona State. QB KEEPER: Justin Herbert “relaxes” on the goal-line after scoring what was the go ahead TD. But the Ducks were not in LA-LA land; I had only gone there in my head. Instead, the Ducks lost to a mediocre ASU team in Tempe. The Ducks are not back. And now, after being teased for the first three games, the harsh reality of the situation sets in: Oregon has a ways to go. After their Jekyll and Hyde act the past two games with monumental first halves followed by ugly second halves, the Ducks were a fusion of both against the Sun Devils. The Oregon offense had terrific offensive drives, immediately followed up with mistake-prone three-and-outs. The Ducks made stout defensive stops, followed by blown coverages, penalties and a softness up the gut which matches that of your average middle-aged guy with an unhealthy diet and sedentary lifestyle. (And yes, I just looked in the mirror as I sit here typing away with a chocolate chunk muffin on deck.) All this was against a team that was averaging less than 100 yards rushing per game. 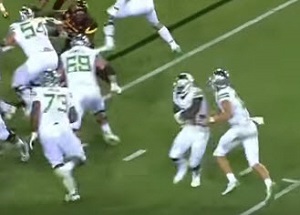 A) The Ducks were 1-for-11 on third down. ASU was ranked 129th defensively in this category. B) Oregon was 0-2 on fourth down. C) The Ducks’ average third-down distance was 8.8 yards. D) Royce Freeman only had 15 carries. Justin Herbert had 10. TD STROLL: Johnny Johnson III takes a leisurely walk after scoring. F) They allowed a 52-yard completion on third and 27. G) Fourteen penalties were issued for 99 yards. H) The Ducks got caught with their heads up their butts on an onside kick. I) They allowed more yards on an opponent’s first 31 plays than were given up in an entire game just one week before. J) ASU was averaging less than a hundred yards rushing entering the game and put up 142. K) Herbert was not as accurate as he has been (seems to need a little more air under his longer passes). L) There was a general lack of communication on the offensive line. Despite all the Ducks’ errors, they still had a chance to win. As the Devils scored two quick touchdowns to start the second half, an “uh-oh, we’re no better than last year” may have crept into the minds of Oregon fans. But instead of turning into a blowout — as it may have last season — the Ducks fought back and still had a chance to win in the final minute. The Ducks showed savvy, albeit against ASU, they didn’t have last year. After this loss, there isn’t the hopelessness that set in last year when things began to head south. After all, the future looks bright. Of the 64 players on the depth chart, 16 are true freshmen and the other 52 are Helfrich players. Pair that with Oregon’s excellent recruiting to this point under Willie Taggart, and things will only improve. DECISIONS DECISIONS: Herbert keeps it on his way to the pay dirt. The foundation is there, but the Ducks clearly need more players on the defensive side. And guys like true freshman cornerback Thomas Graham are only going to get better. It’s possible that the Sun Devils found themselves against the Ducks. 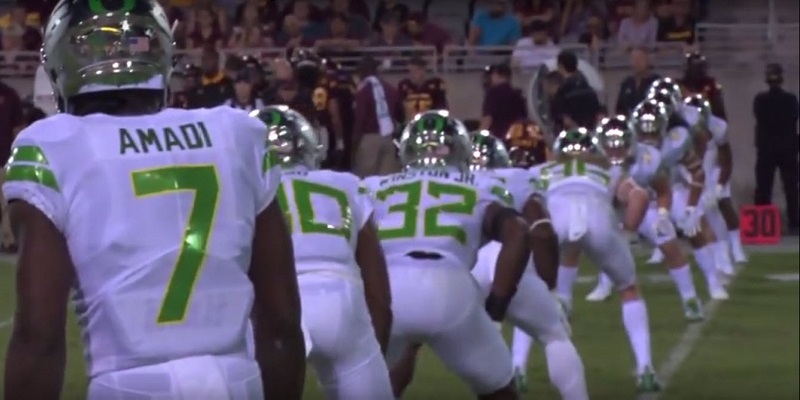 They are a team with talented athletes on offense: a quarterback who out-dueled our very good Justin Herbert, paired with a receiver or two (N’Keal Harry in particular) who look like they have a future on Sundays. As we turn to Cal, it looks as though the Pac-12 may have more parity than ever, with the Beavers as the league’s only true pushover. The Bears, which all Duck fans had chalked up as a “W” before the season began, now look like the favorite going in. Collective sigh in Oregon Country. In the end, on Saturday, maybe the Ducks strategy, in what can now be considered a rebuilding year, is to give “hot-seat” coaches like Todd Graham (Jim Mora and Rich Rod) an argument to keep their jobs and therefore lower the chances of the Ducks having to play against better Pac-12 coaching (e.g. Chip Kelly) down the road. Probably not, but it’s the spin I’m buying into as my mind refuses to accept reality and once again slips off to LA-LA land.